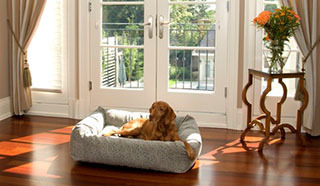 Is there dog furniture that will keep your home clean and your pet happy? Dogs naturally come in with dirt, mud, hair and more. We've choosen home decor items that will help you manage the mess. Have fun decorating with dog beds, dog mats, pet steps, furniture throws & blankets and dog crates. We'll be adding more fun & functional home furnishings and accents. Check back soon!